Destiny Child is a fighting RPG where you play the role of a socially awkward demon who along with his trio of supporting succubi, Mona, Lisa and Davi collects human souls to create the strongest army ever in his quest to win the Archfiend Contest and become the ruler of the Infernal Realm. 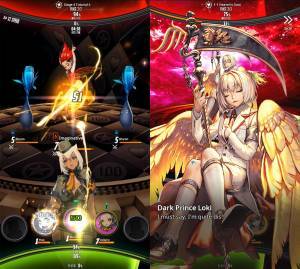 The objective of the game is to collect characters known as 'Childs' and lead them in real-time combat against enemies and challenging bosses. There are over 300 of these characters which are led in teams of five, they can be obtained primarily through the game's summoning system as well as by simply playing through the story. Each child has their own abilities and stats as well as backstory. There are main scenario quests, PvP and daily missions and progression through the game's story is largely linear and stage based. It is recommended that to begin with you complete the step tutorial quests as they will allow you to familiarise yourself with your characters, the basic game mechanics and learn some basic battle moves and strategies. Completing all of the step tutorial quests will also earn you a free 5-star summoning ticket. To begin with focus on Story mode and reaching level 12 as doing so will have unlocked all the features in the game. Try to clear the Story mode chapters with a 3-star completion, especially on chapters 8, 16, and 24 as doing so will earn you additional rewards. Clearing Story mode chapters will also reward you with additional characters as well as the means to get more by summoning. When you reach the point where you cannot acquire a 3-star rating for a chapter you may need to start working on improving your main team. Progressing through the game gaining EXP for you and your characters is essential as it enables you to unlock additional features and game modes. You will gain EXP from each battle you engage in. You can make your team use their skills automatically during battle by using Auto mode. This however will not include drive skill which you will have to do manually. You can save time during battles and farming stages by going 2x speed. If you are a free-to-play player you need to make sure you prioitise Liza's daily tasks as it is the only way to earn Blood Gems. These dailies are simple to do and can be completed within half an hour. Listed below are the best places to farm the indicated currency, material or equipment. By logging in daily you can get some free rewards that become better as days go by. On the 30th day you are guaranteed a 5-Star character. It's worth logging daily even if you do not play that day just to get the reward.